The Benue House of Assembly has suspended six Local Government Area Chairmen for three months, over alleged misappropriation of public funds and gross misconduct. 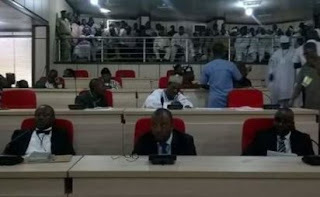 The House suspended the Chairmen on Monday during plenary in Makurdi. The suspended chairmen were that of Oju LGA, Mr Augustine Okwoche, Makurdi LGA, Mrs Justina Akange Audu, Kwande LGA, Mr Terdoo Kenti and his vice, Mr Aondowaser Andrew. Others were the chairmen of Agatu LGA, Mrs Comfort Echoda and her vice, Mr Joseph Ngbede, Okpokwu LGA, Mr Francis Oguche and Gboko LGA, Mrs Becky Orpin. The house had received a correspondence from the State Governor, Samuel Ortom, accusing the suspended chairmen of misappropriating local government funds, gross misconduct and abuse of office. Ortom, in his correspondence, urged the house to approve the suspension of the accused Chairmen. In its decision, the House unanimously agreed that the chairmen be suspended for three months while they investigate the allegations against them, saying that their offences were contrary to the Local Government Area Law. All the local government Chairmen suspended are members of the All Progressives Congress. Mr James Ornguga, the publicity Secretary, of the All Progressives Congress (APC) in the state, has described the suspension of its six local government Chairmen in the state as being politically motivated. Ornguga speaking on Monday in Makurdi said that the allegations of financial impropriety against them were smokescreen. ” If you say, their suspension is due to financial impropriety, how about that of Buruku local government council Chairman, who is related to the governor. “There are more damaging allegations against her but the governor has chosen to sweep them under cover. “The Chairman of Apa local government had the same issues against him, but as soon as he decamped from the APC to the PDP, all allegations were dropped. “The governor is just being vindictive and punitive just because the Chairmen refused to decamp to the PDP with him; the man is just revealing his true colors, but not to worry, he has but a short time to leave office,” he said. Also commenting on the suspension of all 8 APC lawmakers by the Benue Assembly, Ornguga said the matter was already in court.